This weekend was a shopping weekend for my daughter and I. I hadn’t planned it that way but it just turned out as one. One of the things we started working on was her clothes for the new school year. Here in our area of South Florida the elementary school children are required to wear uniforms. Each school is different and I’m happy that our school is a little less strict when it comes to colors. The children have to wear a plain polo shirt but it can be any color. This was a nice change from the previous school my boys attended where they were only allowed to wear 4 different colors. 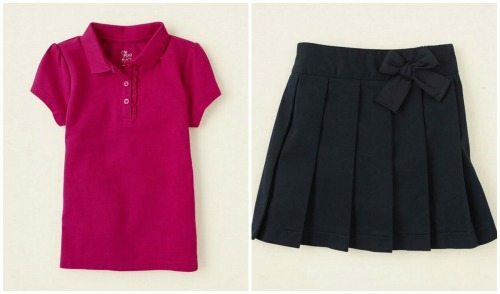 My daughter is very picky, last year she wore nothing but navy skirts. Did you know you could purchase school uniforms at The Children’s Place? I have a hard time finding uniforms sometimes and am always looking for somewhere else to shop. Currently a lot of our shopping is done online. I find myself throughout the summer looking for sales to stock up on the coming years wardrobe. If not and my daughter is in need of something later in the year it is not as easy to find. I’ve got three kids to clothe for this coming school year so any savings is helpful. I’m excited to give you the opportunity to win an awesome prize that will really help out with your back to school shopping. 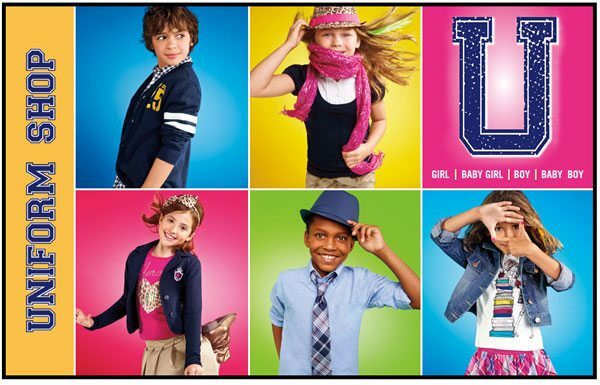 Enter below for a chance to win a $500 The Children’s Place gift card. Disclaimer: This giveaway has been sponsored by The Childrens Place and hosted by Kidsumers. I have not been compensated and all opinions are my own. All opinions are my own. You may read more of my disclosure here. I love the little tie & hat with the blue shirt. It just looks nice. I love the jean jacket and bright colors. It just looks fun and my daughter would want to wear it! Love the cardigan. No way would my kids ever wear that hat and tie, as cute as it is though. I like the little boy with the hat and tie. So cute! I love the sporty sweater on the little boy because it’s so classic and preppy. My favorite outfit is the girl with the jean jacket because it looks comfortable and cute at the same time. i like the outfit with the girl wearing the jean jacket; my daughter would love that outfit! Love the one with the tie and the hat. Little boys with ties are so adorable. I like the shirt and tie that the little boy is wearing. I can see my boys wearing that to church. i like the little girl wearing the jean jacket. it looks really cute and comfortable and could be worn with so many different outfits. I love the outfit on the bottom right girl with the plaid pink skirt, tee with stacked books, and denim jacket. First off, I love having a denim jacket in my wardrobe and I think my daughter would too. Second, my daughter loves pink and skirts so this would be her pick. I love the girl’s outfit with the jean jacket. I know my little girl would love it. Style is so nice too. I like the pink skirt with the jean jacket. I just think it looks cute! I like the boys look from the middle on bottom. My little guy loves to dress up. My favorite is the bottom blue background pic on the right of the girl in the jean jacket. I like that the clothes would be age appropriate for my 7 year old grand daughter and the skirt is adorable. Love the books on the front of t as my grand daughter loves to read. And any jean jacket outfit is very versatile, such a great look! My favorite is the one in the lower right corner with the little girl with the faded jean jacket and pink skirt. So cute! My favorite is the bottom row right o/f with the denim jacket. I love the shirt and skirt too. I would dress any of my 3 granddaughters in that outfit. I like the top left. Cute and cool, but still little boy. I love the little girl in the last outfit, as it looks fun and comfortable. The boy in the top row is a great fashion look. I love the top middle!! Love scarves on little girls! My oldest does to! I’d love to be able to get her some new back to school clothes! Love the girl’s outfit with the denim jacket. Very hip, cute and comfy. Also, the jacket could be worn with so many other outfits.